New, furnished apartment on the top floor of the building, ideal for 4 people. It has 1 suite with 1 super king bed and 2 single beds, bathroom and dressing table, wardrobe, split air conditioning and ceiling fan, iron. The cleaning service is daily but the washing of the dishes is by the guest. It has a complete and equipped mini-kitchen, stove, refrigerator, microwave, sandwich maker, blender, utensils, bench with 5 stools. The living room has a sofa with 1 single bed below, TV, ceiling fan and air conditioning, 2nd bathroom with shower, balcony overlooking the pool. The condominium has a steam room and Wi Fi. The apartment is entitled to 1 parking space, not demarcated. The apt is in front of the pool in a very nice place. It is possible to book one of the barbecue grills that are in the pool area at no additional cost. Condominium is secure with electrified fence and 24 hour concierge. Bed and bath linen is provided according to the number of people in the apartment. The condo will exchange after 4 nights. Exchanges of towels or bed linen before 4 nights will be charged and must be settled by the host, directly with the administration of the condominium. The electric power is 220V. Ask to check the property at the entrance and exit. The bathroom of the suite has, Shower with hot / cold water. toilet with shower. The toilet with sink is outside the bathroom. The bathroom 2 is in the area of ​​the room and is complete. The water heating is central. 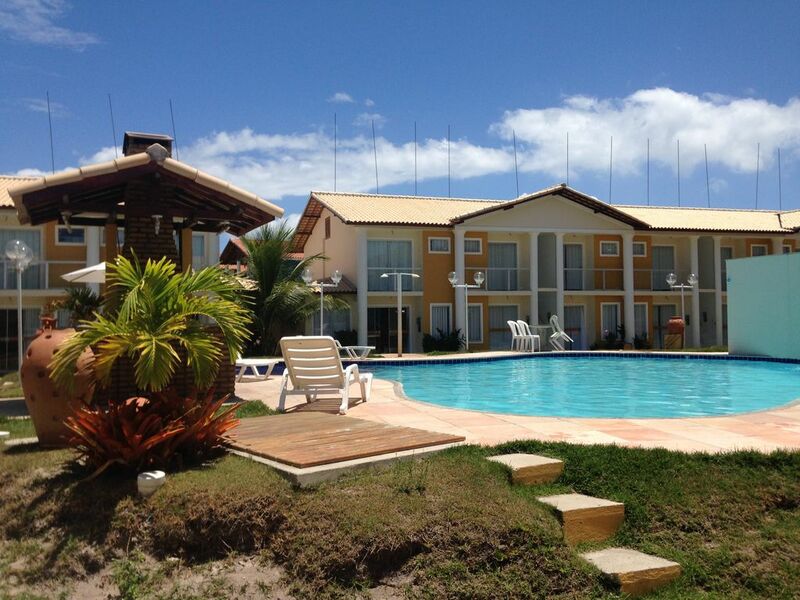 Located 200 meters from the best beach of Porto Seguro, Taperapuan. The Residencial Monte Hebron has 2 pools Adult / Child, plus sauna and barbecue grills. The apartment is in a very green area, close to restaurants as the Wooden Spoon, the Axe Moi tent, place of shows and entertainment. In a short walk, we find, supermarket, pharmacy, fuel station, ATM and car rental. On the beach has water sports. Leaving the condominium north coast comes to Santa Cruz de Cabrália and a ferry that takes you across to the St. Andrew's village, where the German selection built a resort and stayed focused during the 2014 World Cup .Santo André has beautiful beaches and the calm sea. In Cabrália there is the community of Pataxós Indians, where you can buy handicrafts. Leaving for the south coast, we arrive at the Porto Seguro center where the night has a street known as the catwalk of alcohol. Local foods and drinks and crafts. Porto Seguro, runs the ferry across the river Buranhém and arrives in Arraial D'help. The beaches are beautiful as the Pitinga. The night Arraial is very nice, and possible dinner in numerous international and varied food restaurants or enjoy the live music in bars hipsters.